With T.J. Oshie expected to return to the Blues’ lineup Saturday night, a roster spot had to become available. Matt D’Agostini, a former 21 goal-scorer, was the odd man out. It was announced Friday morning that the Blues traded D’Agostini, along with a conditional seventh-round draft pick in 2015, to the New Jersey Devils in exchange for a conditional fourth-round draft pick in 2015. The fourth-round pick will become a fifth-round pick if D’Agostini chooses not to re-sign in New Jersey this summer. The Blues were out of options, as goaltender Jake Allen was the only viable player who could be sent to the AHL without having to clear waivers. With Allen posting an outstanding 8-2 record thus far, the Blues were forced to consider other options. Goaltender Brian Elliott and forward Chris Porter were potential players to be sent to the Peoria Rivermen, the Blues’ AHL affiliate, but they would have had to clear waivers. It is believed that both players would have been claimed by another team during the 24-hour waiver period. D’Agostini quickly became a fan-favorite after being acquired by the Blues at the 2010 NHL trading deadline in exchange for forward Aaron Palushaj. Although he was rarely used for the remainder of that season, D’Agostini asserted himself as a top-six forward, breaking out with 21 goals in the 2010-11 season. With the Blues riddled by injuries most of that year, D’Agostini stood out as a top goal-scorer for the Blues. 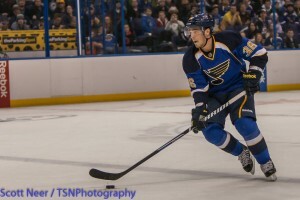 2011-12 brought different times for the Blues, leading to some changes in the Blues’ system. Newly appointed Head Coach Ken Hitchcock stressed a defense-first system, making D’Agostini’s offensive prowess a little less needed. D’Agostini also suffered a concussion on February 7, forcing him out of the Blues’ lineup for 26 games late in the season. When he returned on March 31, he was mainly used as a fourth-line grinder as the top two offensive lines were already determined for the rest of the season. D’Agostini was held to just four playoff appearances out of the Blues’ nine total games. 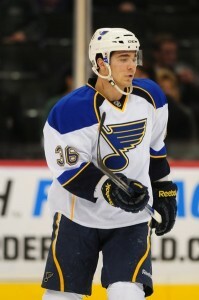 D’Agostini was used sparingly to start the 2012-13 season, playing in just one of the Blues’ five seven games. He was used more as the Blues started facing injury troubles, but posted just one goal and one assist in 16 games played. Although D’Agostini has found the trouble to score as of late, he could find that spark again with the Devils, who are currently ranked 23rd in the league with 2.45 goals-for per game. With a quick wrist shot and the ability to find open ice, he could fit well with a group of talented Devils forwards. The 26-year old winger was with the Blues in Whistler, British Columbia during a morning skate when he learned the news of his departure. He said quick goodbyes and took a bus to a local airport, where he will fly to meet his new team in Newark, New Jersey.